Armadillos are odd enough to occasionally end up stuffed, mounted, or imitated as art. I’ve collected a few examples here of various armadillo items. Charles Apelt, a German basketmaker, first popularized the armadillo basket by displaying one at the 1902 World’s Fair. His family company, the Apelt Armadillo Company (including the Apelt Armadillo Farm, the only known commercial attempt at raising armadillos) was in business until the 1970s. An armadillo basket is generally a dried armadillo shell, including the tail and often the head. 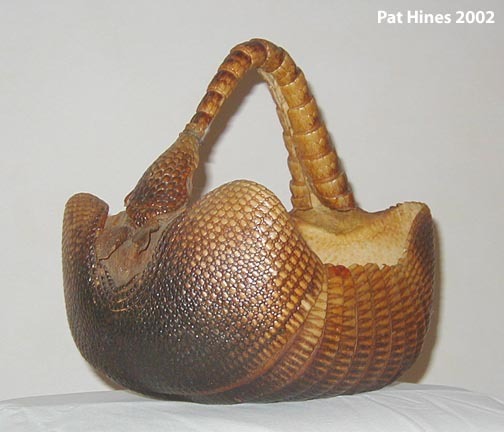 The armadillo shell sits on its back, with the tail curled up over the shell towards the head to form a handle. I do not currently know of any commercial supplier of armadillo baskets. A similar armadillo item is the stuffed armadillo, occasionally presented lying on its back with a bottle of beer tipped up to its mouth. Although whole armadillos without such adornment are available (a whole mount was featured in the background of the judge’s office on the sitcom Night Court, for example), the decorated or posed models seem to be more popular as a tourist item. The armadillo has been actively used to promote Texas tourism since the 1890s. The charango is a traditional South American instrument, similar to a small 5-stringed guitar. You can learn a little more about the instrument on the Latin American Folk Institute website. The charango is based on an early Spanish instrument called the vihuela, which was popular with the indigenous population. The woodworking necessary to shape the body of the instrument was complex, but could be replicated fairly easily by substituting an armadillo shell for the curved wooden body. Thus, the charango was born. I do not currently have a photo of a charango, but you can search Google Images for a charango photo. The armadillo as a decoration or souvenir has been popular for quite some time. The state of Texas, for example, seems to have passed a law requiring the presence of at least one item featuring an armadillo in every store. (This is of course a joke, but you are guaranteed to find lots of armadillo items in Texas.) Armadillos can be seen adoring pins, license plates, T-shirts, hats, boots, etc., and have in the past been popular as stuffed animals or hand puppets from various companies. I do not maintain a list of companies or businesses that stock armadillo-themed items; I don’t have the time to do an exhaustive search every month, and Google does a much better job of indexing the suppliers than I would anyway. If you’re looking for something specific, start with a Google search for “armadillo merchandise”, or search for “armadillo” on Froogle, the Google shopping service, and narrow down the results from there. One item I will specifically point out here is a book: ’Dillos. Roadkill on Extinction Highway?, written by William Klemm, D.V.M., Ph.D., a professor at Texas A&M University. If you know an armadillo lover who is interested in learning more about these strange animals, a copy of this book might make a great gift.